I'm no stranger to mood swings. When times are tough, I'm particularly prone to them. However, it's bad enough dealing with my changing emotions when my days are relatively predictable. It's quite another when the day seems to be having mood swings of its own. 1:45 am to 8:00 am: Mia managed an enormous stretch of sleep (with a break to coo and chatter and generally keep me awake for 30 minutes or so at 6:00 am). Still, a big win. 8:30 am: Tom, Michael and I enjoy a pleasant breakfast. 9:00 am: Tom realizes that it's 9:00 and he has not yet showered, let alone departed, and I realize that Abby is still sleeping. 9:30 am: Abby awakes and needs breakfast, but I've got her siblings downstairs. What to do? 9:35 am: Due to a brainstorm over which I am still quite proud, I quickly put together a dining area for Abby in the basement, just outside the playroom. She finishes her breakfast with no complaints and very little mess. 10:30 am: Mia is beyond overtired, but Michael's tantrum, (which began when the HVAC guy swung the gate shut behind him) is interrupting her attempts to nod off. 10:40 am: Awesome Mommy Brainstorm #2, utilizing the set-up from Awesome Mommy Brainstorm #1. 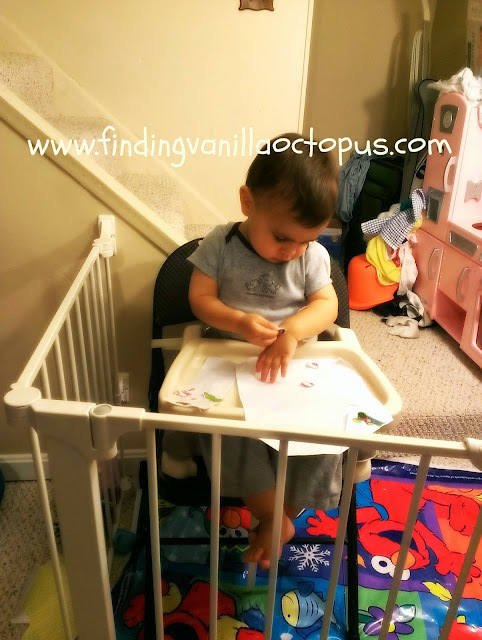 This kid loves his stickers, so- even though he hates the chair- a sheet of them and a blank piece of paper bought me the five minutes I needed to whisk Mia off to a dark, quiet bedroom and get her sleepy enough to put down. 11:40 am: Mia's cries ring over the monitor, which means that she got less than an hour of sleep. Boo. 12:40 pm: I host lunch a little late to accommodate my sleepyheads, and it goes off without a hitch. Having pre-made macaroni and cheese at the ready certainly never hurts. 1:40 pm: All seems quiet, and Mia seems ready to try for a nap again. She goes down, no problem. 2:15 pm: Abby starts making it clear that she's awake. Given the time, it's likely that she never slept at all and has simply been waiting until now to begin banging and running around. 2:30 pm: Mia wakes, having gotten even less sleep this time. 2:35 pm: I can tell from halfway up the stairs what the issue was with Abby's nap (or lack thereof). The smell is impressive, and unpleasant. Down to the basement I go with both girls, and begin hearing Michael's waking whines just as I finish up Abby's diaper change. 2:45 pm: We're all back downstairs again- Michael has willingly given up his binky and is in a pretty great mood. 3:15 pm: Things start going downhill with Mia, fast. 4:00 pm: I've got Mia in the wrap, but I'm getting tired and she's unhappy when I sit. Abby is suddenly feeling the effects of her non-nap and being cranky and defiant. 4:30 pm: I decide to try some wrap-free time with Mia, and manage to nurse her to sleep. 4:40 pm: I drop Mia off as quick as I can in her crib: no fuss, no muss. 5:20 pm: And there's Mia again, as Michael starts getting fussy, himself. Her shortest nap, yet. 5:21 pm: Mia's back downstairs, and crankier than ever. I thought for sure when I spotted her latest tooth yesterday that the worst was over. 5:40 (ish): Tom is finally home, and his arrival couldn't come a moment sooner. I've still got a few hours left before I can really start to decompress, but at the very least I've got another back available to attach a miserable, teething baby to. Believe you me, I took advantage.